Op woensdag 25 november, in de week voor de VN klimaattop COP 21 in Parijs, organiseert het HIER klimaatbureau de achtste editie van de internationale Conference on Climate and Developing Countries over klimaatadaptatie en klimaatmitigatie in ontwikkelingslanden. De Conference on Climate and Developing Countries: From Paris to Practice vindt plaats op woensdag 25 november 2015 in Madurodam in Den Haag. U kunt zich gratis registreren door even een e-mail te sturen. Graag even aangeven welke workshop (zie hieronder) u wilt volgen in ronde 1 en ronde 2. Ms. Pepetua E. Latasi is negotiator for Tuvalu and responsible for all climate change related matters at the Ministry of Environment of Tuvalu. She will share her view on the negotiations from the perspective of a least developed country. 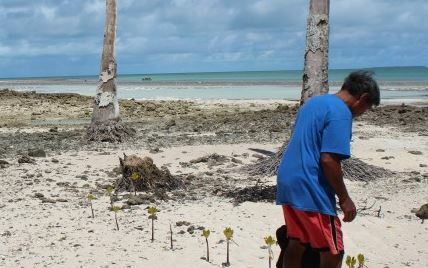 She has been an advocate of Tuvalu’s vulnerability to climate change and its impacts for years, both on a national and an international level. As a former member and chair of the Least Developed Country Expert Group, Pepetua Latasi has valuable experience in the climate change negotiations. She recently becameCo-chair of the Executive Committee (Excom) of the Warsaw International Mechanism for Loss and Damage Associated with Climate Change Impacts, and will tell us about the recent developments on the issue of loss and damage leading up to COP21. Also, we want to address the topic of attribution. What extreme weather events are already happening because of climate change here, and in developing countries? And how can we attribute those events to climate change? KNMI and the Red Cross Climate Centre have been working on the topic of attribution for several years. Maarten van Aalst, director of the Red Cross Climate Centre, will share their latest insights with examples of extreme events that happened in the last years in different parts of the world. 1. Climate Finance: achieving climate and development goals: IIED Chief-economist Paul Steele will guide us through the world of climate finance, ahead of the Paris negotiations, and will go into detail about how to connect climate finance with development goals and achieve both emission reduction and development. 2. Reflecting on 5 years of resilience programming: lessons learned and challenges for the future: In this workshop, Partners for Resilience will talk about 5 years of learning from resilience programming (2011-2015) and introduce their plans for the next five years, followed by a debate about “Lobby and advocacy on the climate agenda after Paris”. Key questions dealt with in this interactive debate session will be: How to take the climate agenda forward after Paris (and after the SDGs)? How to best influence NAPs and broader climate and development agendas at the country level? How to ensure local knowledge on risks, and capacity to address them, is reflected in national policy and investment? 3. Clean cooking – linking corporate social responsibility HERE with impact THERE: Update on Dutch clean cooking activities by HIER klimaatbureau, FairClimateFund, BIX fund and Climate Neutral Group. With a new project, COOX4Climate, they want to stimulate companies and consumers to offset their carbon emissions by investing in clean cooking projects in developing countries. 4. Climate Smart Agriculture: Farmers are heavily affected by climate change, but can also contribute to mitigate climate change by improved farm management. However we rarely talk about soils, the missing link in the carbon cycle. André Eitner from Soil and More will show the benefits of soil management and give an introduction into a new methodology to measure benefits for the use in carbon credits. 5. The need to focus on pro poor mitigation – a case study on access to renewable energy in Malawi: When speaking about climate and development the focus is often on adaptation. Mitigation is mainly thought of as a means to reduce CO2 emissions. However for all those people living without energy and cooking on fire wood there is an opportunity through pro-poor mitigation. Renew’N’Able Malawi (RENAMA), a Malawian non-governmental organization and partner of Hivos in Southern Africa, will tell how to enAble Malawians to Renew their lifestyles based on renewable and more efficient energy sources. The discussion will focus on barriers and solutions and involvement of stakeholders like private sector, cso’s and government. 6. Climate investments in the water sector: The Dutch Agro-Water Climate Alliance (DAWCA) assists companies in the agro-food and water sectors in finding investment opportunities in climate adaptation and mitigation projects. Many projects in the water sector contribute to climate adaptation or could be re-designed to do so. DAWCA and their strategic partner Netherlands Water Partnership (NWP) will talk about climate investments in the water sector in developing countries, and will explore with the audience how climate investments can be mobilized by linking public and private sources. They will also discuss how these projects contribute to the SDG’s.